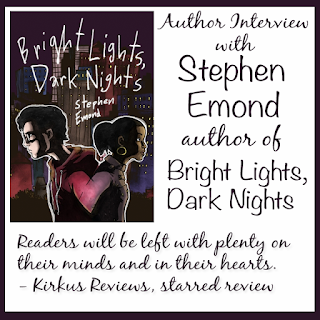 We're thrilled to have Stephen Emond stop by to share more about his latest novel BRIGHT LIGHTS, DARK NIGHTS. Stephen, what was your inspiration for writing BRIGHT LIGHTS, DARK NIGHTS? Writing what eventually became BRIGHT LIGHTS, DARK NIGHTS was a very organic process. Elements of the final book I saw right from the start, but so much of the story developed from spending time with the characters and world. The initial idea, or story gimmick I had, involved Walter being a comic book fan and viewing his world through comic book tropes. Naomi was part of his story, Jason and Lester were involved, but it was more about a kid dealing with growing up in a unique way. As I started churning out chapters, it became clear I was writing two books, one about a kid’s comic book fantasies, and one about the real world reactions to this interracial relationship. I tried for a while to make the two stories mesh but it became clear one story was much more interesting and the other was just a fun gimmick. I had to cut a lot of material out and start again with a much more interesting story to tell. There’s a lot of fighting in this book! The fighting was hard to write – particularly between Walter and his father, and Walter and Naomi. You love these characters and you want them to be sweet and romantic and thoughtful and nice. It’s hard to write ugly words and have these characters hurt each other. I did draft after draft of Walter facing his father and I kept making it too nice, too easy. He really needed to let it all out and say some things that wouldn’t be fun to hear. How long did you work on BRIGHT LIGHTS, DARK NIGHTS? I started it in 2011, shortly after WINTER TOWN came out. Or possibly before, I’d have to check the timeline for WINTER TOWN, but it was the summer of 2011 that I was toying with three book concepts, a ghost story, a band story, and this comic book reading kid. I shared those three with my editor who said she found the most potential in Walter’s story. HAPPYFACE and WINTER TOWN took me about a year or two to write and draw each, this one was a much longer process. Part of the reason for that was a few false starts, as I discovered what the story I wanted to tell actually was. Part of it was I was also doing art and animation for some iPhone games at the same time. And part of it was the story being a very, very sensitive tale and being extra careful to give every character dimension and avoid stereotypes or hurtful images. I went through a lot of drafts making sure it was something I could stand behind. I learned a lot of the things Walter learns in the book, particularly about privilege. Earlier drafts had problematic scenes, things that I thought were just part of the story and the way it was, things I didn’t see any issues with. I had to learn to really look at my own text from different viewpoints and see how they could be taken. I had to work hard to show Walter as a flawed person, I had to make sure he wasn’t coming into the city and fixing everyone’s problems, likewise I had to be sure he wasn’t coming to the city and having everyone fix his problems. Everyone needed to have a history and a purpose and good and bad to them. The road to publication was difficult. I knew this was something special for me, I’d written 2 books and a comic book series before this, and this book I really have felt from the start was a level above anything I’d written. I knew it was going to get published, but I wasn’t prepared for it to take quite so long. My editor and agent both moved to new companies during the process, both working to keep this book on their plate. There was a very lengthy contract negotiation meaning I didn’t see any money for it until the book was more or less finished. And the false starts and the many drafts of polish dragged the process on for a long time. Before BRIGHT LIGHTS, I’d written HAPPYFACE and WINTER TOWN and the comic book series EMO BOY, and an unmade screenplay for EMO BOY. There have certainly been projects that I started but never finished to publication – I’ve joked about my “sci-fi epic” that I spent months chasing my tail on that I never finished. I have a comic book series idea I’d love to write and draw but it’s hard to find the time. I’ve pitched a middle-grade series as well, but it felt right to follow the path I’ve been on in the YA world so generally those projects fizzle out over time. But it’s always good to have something to come back to when the timing is right! I used to write at home when I lived in a smaller apartment, nowadays I need to be out of my home to write. I usually go to a Barnes and Noble about 10 minutes away from me, there’s enough tables there that I can usually find a spot, something about the atmosphere is inviting to me. I’ll get coffee and listen to instrumental music that fits the tone of whatever I’m writing. For BRIGHT LIGHTS, I had a lot of hip hop and R&B instrumentals that I would play as I wrote. I don’t have anything signed to a deal or anything like that, I’ve been trying to figure out what’s next since December or so. I did a short story for an anthology called “I See Reality: Twelve Stories About Real Life” last fall that should be out in early 2016. Since then I tried a few various YA ideas that didn’t quite take off for me. I settled on a historical fiction that’s pretty far out from what I usually write, but I really like the idea for it. Usually when I see this question asked I see the author already has their next book on deck and a third being written, I guess I’m not that fast! But hopefully it won’t take me 4 years again. 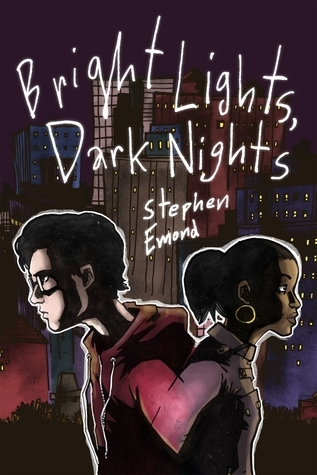 Stephen Emond is the creator/writer/artist of young adult novels HAPPYFACE and WINTER TOWN, as well as the comic book series EMO BOY. He resides in Connecticut. 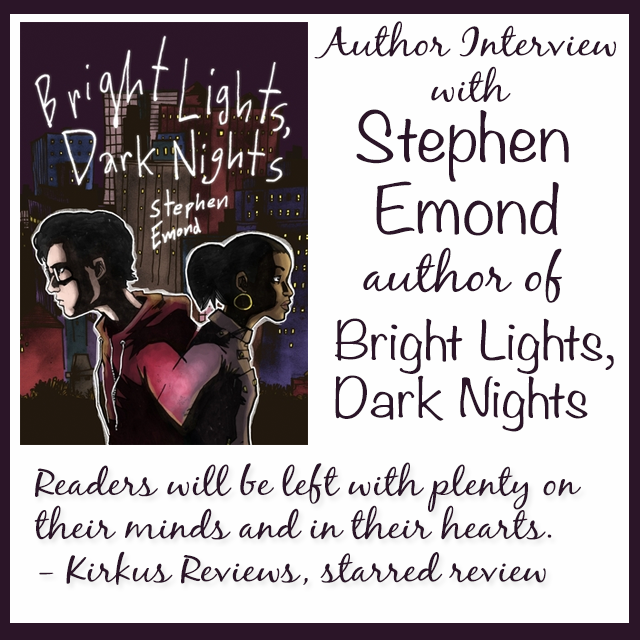 Have you had a chance to read BRIGHT LIGHTS, DARK NIGHTS yet? Have you ever realized you were writing two different books? Do you learn the same things as your characters while writing? Sounds like an interesting book. Thanks for sharing this here. To all out there, who were deceived by what i wrote about Dr Brave of me calling him a scam, it was just that i did not have patient with him, but today i am glad that my husband is back today, and to Dr Brave the great spell caster i am very sorry, i was the one who wrote those words below, please to you all out there who is passing through different kind of problem please contact Dr Brave he is real, and i am sorry for buying your trust on Dr Brave just contact him today he will help you ok.